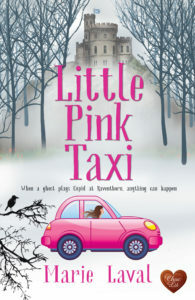 I’m thrilled to be one of the first stops in the blog tour for Little Pink Taxi by Marie Laval, an enchanting, heart-warming and very modern novel. This is a delightful and lively novel, which is romcom with a touch of the supernatural, history and mystery. Our heroine, Rosalie, is bubbly and bright, as cheering as the bright pink anorak she wears. She’s like a breath of fresh air or a sunshiney day. In complete contrast is Marc Petersen, the dour client she collects from the airport. He’s irritable, humourless and critical. He’s a dark cloud on her horizon, in more ways than one. He’s not just miserable company, but he’s come to Raventhorne Castle, which has belonged to Rosalie’s boss Geoff and where she’s lived for a long time, to sell it. Marc has recently inherited the castle from his father, to whom Geoff had sold it without saying a world to anyone. And it’s not just the castle, but also Rosalie’s taxi company that he’ll be getting rid of. That could spell disaster for the whole community of Irlwick. Rosalie is a wonderful character, so charming and genuine. In fact, everyone we meet, likeable or otherwise, is rounded, convincing and human! No stereotypes or cardboard cut-outs here. Marc is particularly complex and it’s fascinating to see how he develops through the book, but not without a few stumbles on the way. The setting in Scotland is picturesque and portrayed in great detail. It’s exquisite. We also get a powerful sense of community which is warm and inviting. There is so much to enjoy in this story! The writing flows and you get swept away by the action. There’s tension, humour, puzzles, a little ghostly intervention, romance, the inevitable misunderstandings – every thing you need to thoroughly engage and entertain you from the catchy front cover to the back one. The author mixes them together in an unusual and clever way and the result is a truly enjoyable novel. Originally from Lyon in France, Marie now lives in Lancashire with her family. She works full-time as a modern languages teacher, and in her spare times loves writing romance and dreaming about romantic heroes. She writes both historical and contemporary romance, and her historical romance The Lion’s Embrace won the Gold Medal at the Global eBook Awards 2015 (category Historical Romance). She is a member of the Romantic Novelists Association and the Society of Authors. 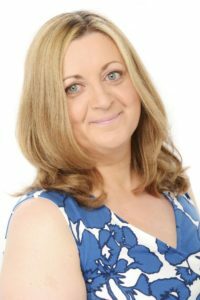 Her native France, as well as her passion for history and research, very much influences her writing, and all her novels have what she likes to call ‘a French twist’! Posted in Book reviews, book tour, Fiction.Tagged ghostly, heart-warming, romcom, Scotland.